No holiday is complete without a theme songs. They create a mood, set to a wave of celebratory help conjure up associations with pleasant events in your life. Holiday songs have a straightforward text and beautiful melody, this is what helps them become successful and remain so for decades. After all, they live in our memory! In English-speaking countries, Christmas (Christmas) is a more important holiday than New Year (New Year), so the songs dedicated to this holiday very much. I want to introduce you to seven very well-known Christmas songs (Christmas songs), while listening to them your mood immediately improved because our favorite winter holidays (winter holidays) just around the corner! Perhaps this is one of the most famous Christmas songs in the world. The author of the composition, which was once called «One Horse Open Sleigh», a James Lord Pierpont. The song, created in 1857, was originally dedicated to Thanksgiving Day (Thanksgiving Day). 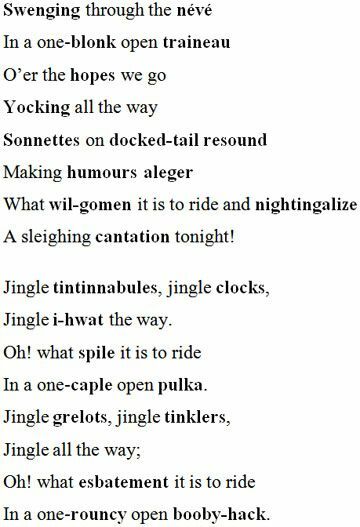 Musicologist James Fuld notes that the word jingle in the title song and the first line of the chorus, obviously, is the imperative of the verb to jingle (jingle, rattle, tinkle). This is due to the use of bells in the decoration of harness horses (to adorn horses’ harnesses), were notified that their ringing oncoming riders and helped avoid a collision (to avoid collision). After the sleigh, pulled by horses (horse-drawn sleigh), produce almost no noise in the snow. If you rely on this information, the name of the song will be transferred «Ring, Bells.» Although now widely believed that the jingle bells — it is a certain kind of bell. «Jingle Bells» was the first song broadcast from space (broadcast from space). Another popular song at Christmas. It was first heard in 1957 by Bobby Helms. Rehash it not once, but the version of Bobby Helms is the most famous. 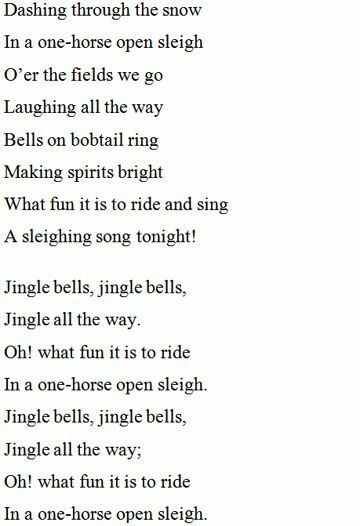 The very name of the composition and the lyrics are partly a kind of parody (parody) to the already known song «Jingle Bells». This beautiful song was written by Johnny Marks and recorded by Brenda Lee in 1958. According to the voice you might think that Brenda Lee quite mature woman at the time of execution of the composition. But in fact, she sang it, as 13-year-old girl. We know perfectly well that song for the movie «Home Alone», will go on rolling in 1990. Remember the scene where the actor McCullen Culkin as Kevin McCallister creates a view that the home runs Christmas Party (Christmas party), and thus deters burglars? That’s it for this stage as background music was selected the song «Rockin ‘around the Christmas Tree». This classic song written by Jay Livingston and Ray Evans, was first performed in October 1950. Initially, the song was an ambiguous name «Tinkle Bells». And like anything wrong with that, because the word tinkle translates to English as «ringing», «chink», «call», «strum». In other words, this verb has almost the same meaning as a verb jingle. But the stories of Ray Evans, wife, co-author of the song Jay Livingston was very surprised that they have not thought of yet another, slang, meaning of the word. A tinkle slang means … «urinate.» Therefore, the name of the song, it was decided to change. Very famous song from the easily recognizable melody was sung duo Wham!, One of whose members was George Michael. It was he who wrote this song. First released in 1984, the song became so popular that it was covered by different artists in different years. In some years, this song was # 1 single. But to be honest, the main theme of the song is love, relationships and separation. And on Christmas there is only a phrase Last Christmas, defining a time period when these events occurred. The protagonists of this song is a folklore character Sandman (Sandman) and a lonely girl who asks him to send her a dream of an attractive young man. The author of this composition — Pat Ballard. He wrote it in 1954, the same year she performed her band The Chordettes. What is the attitude of this song have to do with Christmas? After the release of the song Ballard thought and decided to rewrite the text, at the same time changed its name to Mr. Santa. Let’s listen to this song. Since the composition has become one of the Christmas hits. I am absolutely sure that each of you have heard this song, even without knowing its name. It was played in many films such as Back to the Future. Year established composition — 1958. The author and performer became Ross Bagdasarian. But He did not make the song popular. All the laurels went to a trio of fictional chipmunks (chipmunk): Alvin, Simon and Theodore. You’ve seen the movie «Alvin and the Chipmunks»? We are talking about the main characters of this picture. By the way, the song has received three Grammy Awards. If you like a certain song from this list, you can easily find its expression on the Internet and try to learn them. In this case, the familiar melody will no longer be a meaningless set of words. But the challenge for the most curious! The text of the most well-known song «Jingle Bells» is very easy to learn. And try to read the same part of the text in which some words are replaced by the words with the same meaning, but used hundreds of years ago? After the establishment of the English language it takes place over the centuries. And vocabulary, accordingly, has undergone changes. Team Oxford English Dictionary has processed several proposals by a known (and unique) Historical Thesaurus, thus «grow old» lyrics. I hope that this article will not only introduce you to the history of world renowned tracks, but also helped to settle the Christmas spirit in your soul! Merry Christmas and Happy New Year!